The Ponies love to come here and meet their friends for a yummy snack. 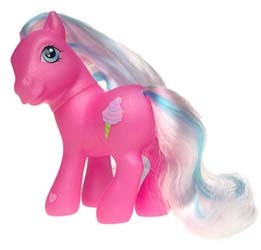 Includes Cotton Candy pony. There's a fancy feast in store every day, because she really cooks up a storm. When Cotton Candy touches the cash register, it magically opens, and the cotton candy spins round and round. Table flips over to reveal yummy-looking pastries. Oven door opens to reveal a delicious pie. Ponies can place their orders at the take-out window. Playset includes Cotton Candy pony, cash register, cotton candy tray, 2 cake slices on plates, teacups, table, oven, brush, charm and labels.